congested because of people dining at its latest addition. want to try their delicious rice pudding or mahalabeya for 3LE to cool down. dine in, and have a swuft and efficient delivery service. including a large cup of Pepsi for 4.50LE, and a small size for 3.50LE. taken away anything from the authenticity of this staple Egyptian dish. Koshary El Tahrir delivers via the numbers 29820209, 29820239 and 29820244. 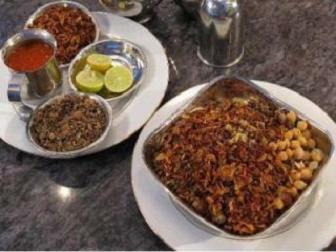 The amazing da'a and salsa makes Koshary El Tahrir special. It might take a while to find a decent place to park as the parking beside the restaurant is usually full.